Two-part pushchair that includes a seat that converts into a carrycot without having to fiddle about with any straps, with just a simple click the seat becomes a comfortable carrycot with enough stability and rigidity to be placed on the floor. Includes a comfortable mattress for when it is used as a carrycot. The chassis has a very simple and compact folding system. This convertible seat along with the baby carrier make it a complete, handy, and economic option to cover all baby’s needs for getting about. Coordinating pram bag with changing mat. Chassis made of aluminium with compact, book type folding system. Compatible with seat that can be converted into a carrycot and with the Zero infant car seat without the need for connectors. Reversible seat unit, so baby can face the parent or the world. Detachable wheels for extra compactness when folded. Reclinable seat with just one hand. Very compact book-type folding. Easy and compact holding. Pro-fix: locks and unlocks the car seat from the chassis with just one movement. Dual installation methods: either using the vehicles seat belt or with Isofix using the ZERO Platform base. 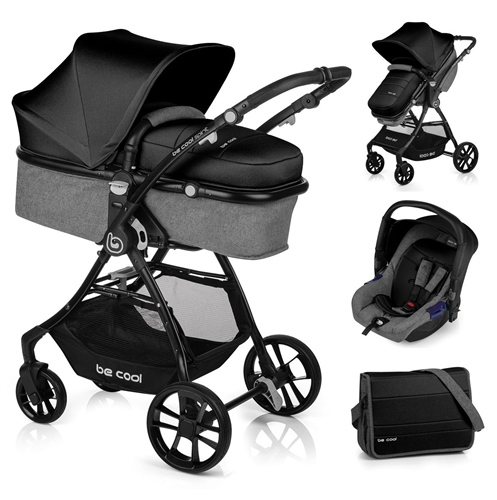 Attaches to JANE & BECOOL pushchairs using the Pro-fix system; no awkward fitting kits required.